With the beginning of summer also comes the end to another school year. 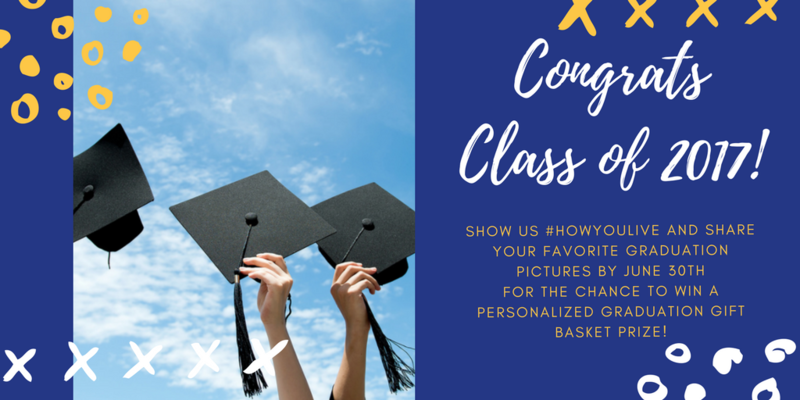 No matter if your loved ones are graduating from elementary, middle, or high school, we want to see them in their cap and gowns with their diplomas in hand in our Graduation Photo Contest! We’ll be crowning one grand prize winner who will win a personalized graduation gift basket prize! Share your favorite graduation pictures with us on Facebook by June 30, 2017. Photos can include anything related to graduation, such as cap and gowns, diplomas, graduation parties, neighborhood gatherings, school colors, and more. We’ll share photos on our Facebook page. Submit photos until June 30, 2017 to be entered to win a personalized graduation gift basket. The HHHunt team will choose their favorite photos and one winner will be announced the days following the entry deadline. HHHunt employees, their family, and representatives are not eligible to win. To find a complete list of rules and regulations, click here. Remember, it’s how you live that matters and we can’t wait to see you and your loved ones celebrating a huge milestone. Happy Graduation and Congratulations Graduates! ← Top Summer Songs to Celebrate the Season!